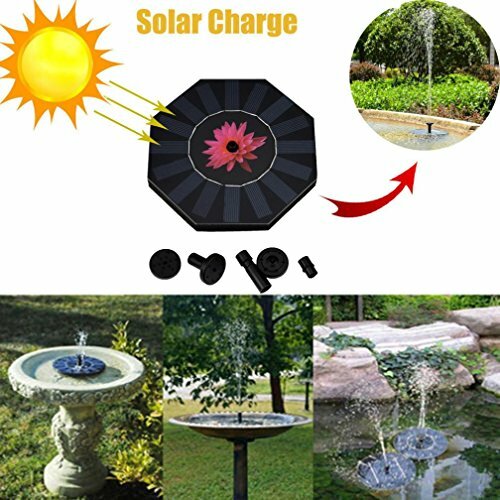 ♪Decorate your fountain with our Ohuhu Solar Powered Birdbath Fountain Pump! Helps to circulate oxyled and water in your bird baths, aquariums and/or ponds and fountains. Fully powered by the sun, this fountain pump runs automatically, is eco-friendly and efficient. It is equipped with 4 nozzle spray design and also makes a great decoration! ♪The pump is full of air during first time use. Once water runs through the pump, it will begin to work normally. ♪Minimum Water Depth in Fountain Should Be 1 3/4"
If you have any questions about this product by Efaster(tm), contact us by completing and submitting the form below. If you are looking for a specif part number, please include it with your message.